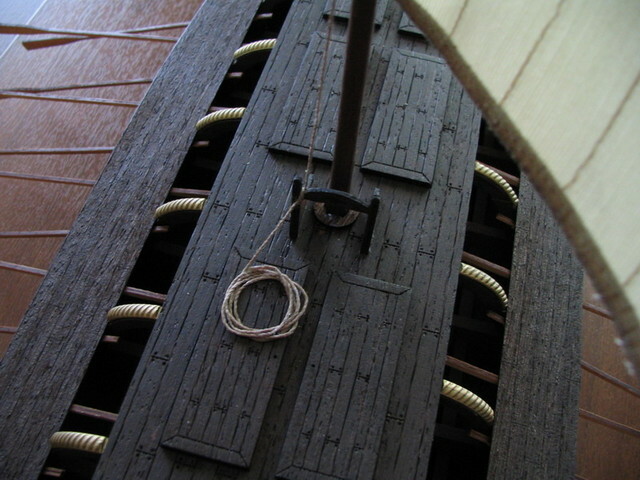 Bireme, ship with two series of oars in each side, was the precursor of trireme and forms the in-between link evolution from pentikoro to subsequent ships. Biremes were made with thirty or fifty oars and the dimensions of these ships are between: 18-22m length, 3-4 m width, 22 tones displacement and the length of the oars 4-6 m. The most famous biremes were made in Samos from tyrant Polykrates and were named samaines. It was a special type of biremes, made in such a way so that could be used as a tanker and as a battle ship in the same time. The bireme displayed is an in-between type made in 450 B. C. The first battle samaines were made in Samos in 250-400 B. C. The effigy-model is a pentikontors bireme, which width is up to 4 meters, united deck, powerful ram-beak and big square sail.